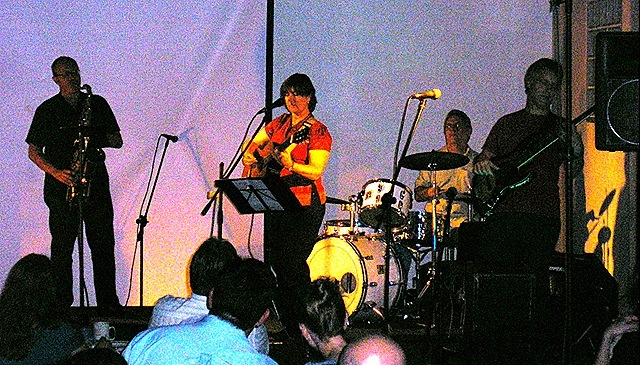 Sue Monk and Lachlan Hurse from Jumping Fences organised Foco Nuevo during 2008 where they presented a mix of musical styles that extends the folk tradition. This regular music event was held on the last Friday of each month and featured a diversity of guest singer-songwriters and musicians. Notices about upcoming ‘Foco Nuevo’ are posted on WBT regularly with recordings, images and videos. This feature on Foco Nuevo is a tribute really, a tribute to two political musos, Sue Monk and Lachlan Hurse, consistent in their art and politics over a period of more than 20 years. 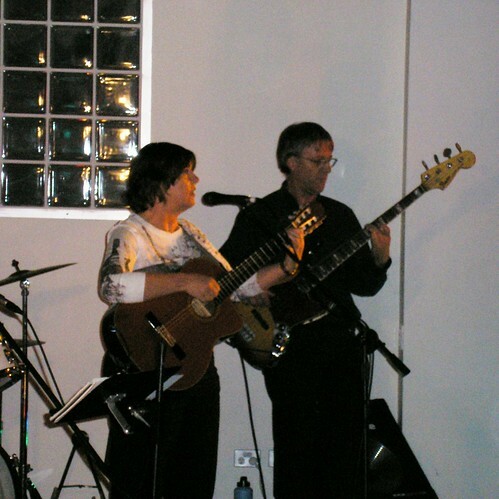 Their band Jumping Fences has included many fine musicians over the years. At Foco Nuevo these included: Ross Gwyther on sax and clarinet (to me he plays like Akker Bilk), James Harper on percussion, and Dan Simpson on drums. 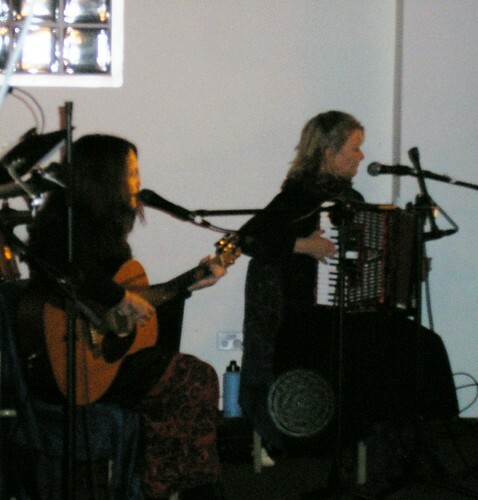 They are often accompanied beuatifully on vocals by Leonor Orellana. They have been accompanied also by Rob ‘ Santana’ Stewart on lead guitar. Rob is from ‘Little Secrets’. Sue and Lachlan put Foco Nuevo together and with the help of local musicians and dedicated helpers like Maggie, Allea, Manal, Kate and Mara made it a success. 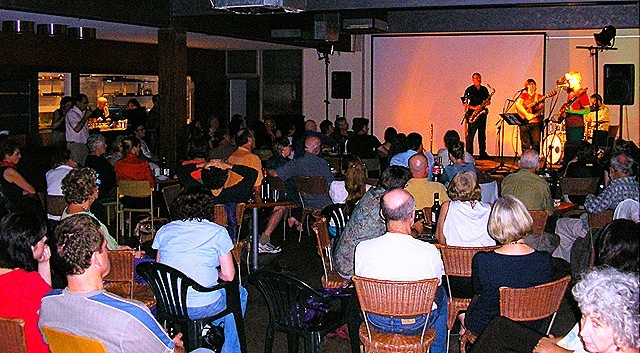 The audiences in 2008 were a good appreciative crowd that contributed to its independence and appeal. Click on the images below to listen to the artist/band that played in 2008. Great food, great cook, Maggie! Combined Unions Choir – Solidarity Forever! Lets hope the same fate that befell FOCO is not true of Foco Nuevo! Kooii, KingFisha and Fyah Walk sum up their music tomorrow night, Sat June 6, at the Zoo, Anne street, Fortitude Valley. Doors open 8.30. $16 on the door. $13 via OZTIX. Kooii’s welcoming and initiating the vibe on first at 9.00. Fyah Walk come from a reggae Byron Bay way. Kingfisha are launching a single. They’re on last. Kingfisha features the bassist and guitarist from Ruby Blue and Anthony on lead vocals who was in the beginnings of kooii. The next night, Sun June 7, Kooii and Kingfisha play at the Soundlounge, Currumbin RSL, Currumbin, Gold Coast Highway. Doors open 7.00. Kooii on first at 8pm. Door $15. On Sunday arvo Lachlan (on guitar), Tom (on bass), both from kooii, and myself are playing at the Sheoak Shack Cafe and Gallery, 64 Fingal rd, Fingal Heads. Free entry. 1-4pm. there’s gigs happening down Byron way this weekend if you’re down that way or care to join us down there. 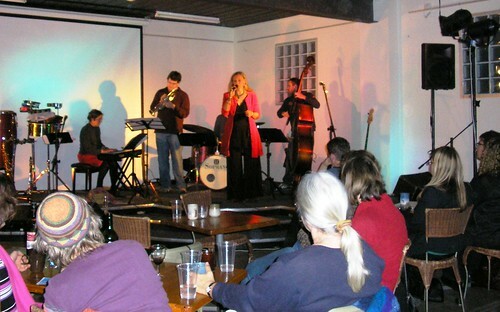 Ruby Blue is playing with Kingfisha this Fri June 12 at the Buhdda Bar, the Arts Factory, Gordan st, Byron Bay from 8pm. On Saturday June 13 I’m playing with 39 strings for their CD launch at the Drill Hall, 4 jubilee avenue, Mullimbimby. 7.30. $15. 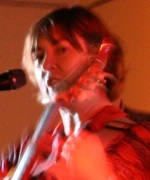 39 is the number of strings on Rob’s harp, Rob Neal being the focal member of the group and source of the group’s songs. 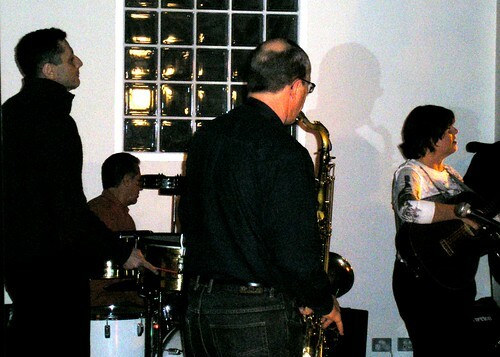 The group also includes naye (israeli flute), persian santoor, violin and bass. An extract from the Hainanese Chicken Chronicles by Lachlan Hurse (from Jumping Fences). Just after reporting on the death of the great South African singer, Miriam Makeba, I have been further saddened by the news of the death of another great musical figure of the 20th century. I have just read a report that Odetta, the deep-voiced folk singer whose ballads and songs became for many a sound track to the American civil rights movement, died on Tuesday at the age of 77 from a heart attack. Odetta performed in Brisbane att Mayne Hall at the University of Queensland during the 1980s. Odetta Holmes, born in Birmingham, Alabama, on December 31, 1930, told the Times in a 2007 interview the music of the Great Depression, particularly the prison songs and work songs from the fields of the deep South, helped shape her musical life. While she recorded several albums and sang at New York’s Carnegie Hall among other prominent venues, Odetta is perhaps best remembered by most Americans for her brief performance at the August 1963 march on Washington, a pivotal event in the civil rights movement at which she sang the song ‘O Freedom’. Rosa Parks, the woman who launched the boycott of segregated buses in Montgomery, Alabama, was once asked which songs meant the most to her. “All the songs Odetta sings,” was Ms Parks’ reply. Odetta, who moved from Alabama to Los Angeles with her mother in 1937, earned a music degree from Los Angeles City College. Radical Brisbane was edited by Raymond Evans and Carole Ferrier, printed by Vulgar Press. FOCO history – Underground developments in the late 1960s among students and radical youth culminated in an exciting new ‘youth club’ venture conducted every Sunday night at the Trades Hall, named after the Foco revolutionary cells of Che Guevara and Regis Debray. FOCO history – Calculated to bring together young students and workers at a regular cultural venue, brainchild of progressive elements in the union movement, acting in concert with the Eureka Youth League and student radicals. FOCO burned like a brilliant comet on the Brisbane Sunday night sky-line for just over one year, before it was snuffed out.